Ask the Expert: What else can I expect on the enhanced pre-populated lab slip? Earlier last month, we announced that we are enhancing our laboratory ID slip and will pre-populate applicant information on all ExamOne laboratory accounts, effective October 1, with the goal of providing a better experience for you and your applicants. Over the past two weeks, our team has received some great questions from our customers regarding this update. We worked with our Product Manager, Jason Day, to answer the most common questions. Q. What is the difference between the e-lab slip that ExamOne already has in place and the new pre-populated lab slip? A. The electronic lab slip is an app that is deployed to a segment of examiners who are equipped with corporately owned iPads. The pre-filled lab slip is targeted at examiners who do not have an iPad, so therefore are still working on paper. This allows examiners to receive the same “pre-populated” benefit that our iPad examiners experience when using the electronic lab slip, thus reducing data entry errors, shortening the time of the exam and improving paperwork quality for our clients. Q. The current e-lab slip is being e-signed. Why does the pre-populated lab slip need wet signature? A. The new pre-populated lab slip is ultimately still a paper version of the form. Instead of the examiner using a completely blank version from the lab kit, we will be printing a version of that form with the work order. This allows us to pre-populate the form with all of the applicant information that already exists in our system. The examiner will still be required to enter physical measurements, such as height, weight and blood pressure and will require an applicant signature at the time of the exam. Q. For paper exams, will the examiner be required to print out the lab slip prior to the exam appointment? What if the examiner does not print it out prior to exam? A. The pre-populated lab slip will automatically print with the work order. No additional steps are required. A blank lab slip will still be available in the kit if for some reason the examiner does not have a pre-populated lab slip. Q. For e-Paramed, will the pre-populated lab slip be incorporated and be e-signed? A. This process does not impact our iPad fleet. We will still continue to collect electronic lab slips in the same manner we do today. Q. 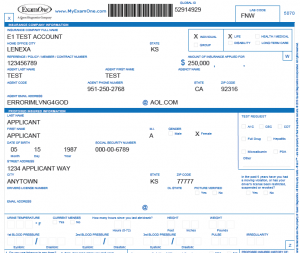 It was communicated that ExamOne will send the lab slip to the client electronically. 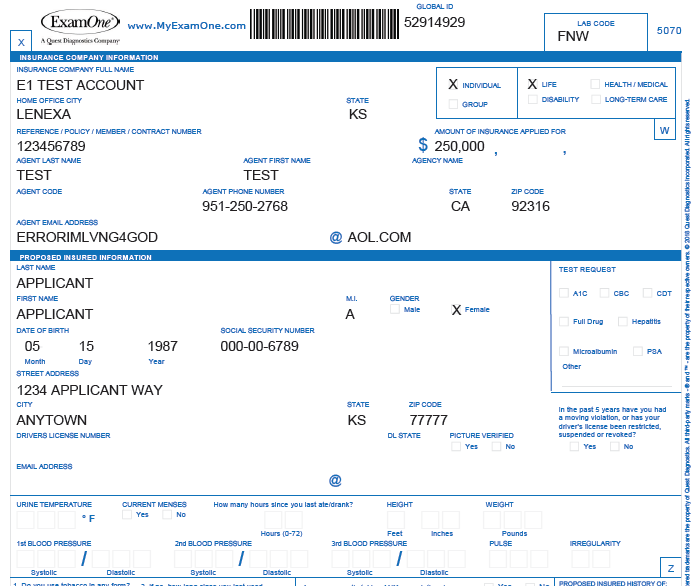 Will ExamOne also send the instructions on how applicants can obtain their laboratory results online? A. Results delivery will remain the same as they are today. The only notable change is that the client will begin to see more of the handwritten lab slips replaced with typed versions. Applicants will receive instructions on how they can access their laboratory results as they do today. Q. Does this pertain to Canada too, or only the US? A. The pre-populated lab slip is currently available only on U.S. orders and in English. Q. Is the pre-populated lab slip different than what we are receiving today? A. The lab slip itself will not be different. We have just identified a more efficient way of providing it to the examiner. We are excited about the improvements that will be a part of this update. If you have any further questions, please contact your Strategic Account Executive.